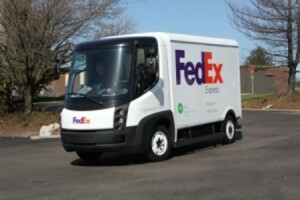 FedEx Express, a subsidiary of FedEx (NYSE: FDX) that handles time-sensitive shipments, announced last week it will double its electric vehicle fleet and add more than 4,000 new fuel-efficient vehicles to its conventional fleet. Over the next two months the company will expand its green fleet by putting 24 all-electric vehicles (EVs) on the road. Once these are all deployed, FedEx Express will have a green fleet of 43 electric vehicles in service. The new EVs will operate in New York City, Chicago, and Memphis. The company is currently operating 19 all-electric vehicles in Los Angeles, London, and Paris. On high-mileage routes, FedEx is replacing 4,000 vans with fuel-efficient, low-emitting clean diesel Sprinter vehicles that are 100 percent more fuel efficient than conventional vans, according to Keshav Sondhi, FedEx Express asset manager. “Since launching our first Sprinter in 2000, we have put close to 1.4 billion miles on these more fuel-efficient vehicles, saving over 66 million gallons of fuel compared to their predecessors,” he said. These new vehicles will be used to study their impact and efficiency. In New York, FedEx Express will work with GE and Columbia University’s Engineering School to study the effect a large vehicle deployment will have on the energy grid. FedEx calls itself the “world’s largest express transportation company,” and as such it is significant that it is expanding its green fleet. In 2008, the transportation sector was responsible for about 27 percent of total U.S. greenhouse gas (GHG) emissions, according to the EPA. The transportation sector is the fastest-growing source of U.S. GHG emissions, accounting for 47 percent of the net increase in total U.S. emissions since 1990, and is the largest end-use source of carbon dioxide. FedEx Chairman, President and CEO, Fred Smith said of our addiction to oil, “What is needed now is an urgent, national commitment to action.” When a transportation company like FedEx operates a green fleet, it influences other companies.